We say in Spain that never is late to report good news. In this case this article covers important news from the last quarter of the year 2018. One more year, organized by CESINE and M2, at the end of the last year 2018 took place in Madrid the PROJECT DAY 2018, dedicated to Project Management. On this occasion it was a Special Edition to celebrate the 20th anniversary of that event. From here we congratulate to the organization of the event and those who made possible its continuity in all these years. AEDIP became involved in the broadcast of the day, in addition to the participation of several representatives of the Association. During the opening session, spoke Javier García-Monsalve, one of the former Presidents of AEDIP, making a brief historical summary since the origin of AEDIP till our days and the evolution of Project Management in Spain during this time. The speakers that participated, among others, were Aurelio Fernández (ALMAR Consulting), which exposed the changes produced in the PM market during the past 20 years, and Elena Holgado (TYPSA), who spoke about the flexibility in the PM services. Finally, Juan Luis Soucheiron (ACTIO), acted as moderator of the second session. We congratulate ALMAR Consulting as the award received as a company in the sector of the WP consulting. We look forward to seeing us in the next edition. 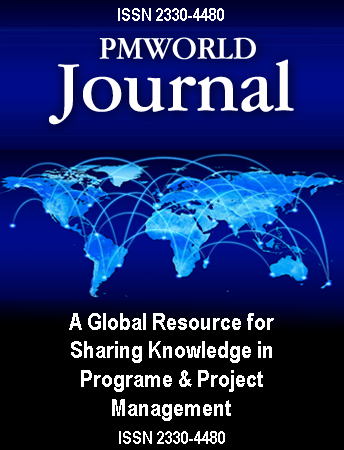 Alfonso Bucero, MSc, CPS, PMP, PMI-RMP, PfMP, PMI Fellow, is an International Correspondent and Contributing Editor for the PM World Journal in Madrid, Spain. Mr. Bucero is also founder and Managing Partner of BUCERO PM Consulting. Alfonso was the founder, sponsor and president of the PMI Barcelona Chapter until April 2005, and belongs to PMI’s LIAG (Leadership Institute Advisory Group). He was the past President of the PMI Madrid Spain Chapter, and then nominated as a PMI EMEA Region 8 Component Mentor. Now he is a member of the PMIEF Engagement Committee. Alfonso has a Computer Science Engineering degree from Universidad Politécnica in Madrid and is studying for his Ph.D. in Project Management. He has 32 years of practical experience and is actively engaged in advancing the PM profession in Spain and throughout Europe. He received the PMI Distinguished Contribution Award on October 9th, 2010, the PMI Fellow Award on October 22nd 2011 and the PMI Eric Jenett Excellence Award on October 28th, 2017. Mr. Bucero can be contacted at alfonso.bucero@abucero.com.